The Race: The Event is a 7-Staged, 7-day, self supported foot race held in New Zealand. The Alps2Ocean Ultra covers a distance of 323k. The race is open to runners and walkers. All runner /walkers that take part in this event are to understand that this event is an outdoor event in sometimes very remote parts of New Zealand. Runners are expected to have a good understanding of outdoor survival skills and have a good knowledge of their gear and how to use it. The trail will be very well marked and there is no need to know how to use a compass. There will be limited facilities available. Participants must be 21 years of age or older at the start date of the race. Special permission may be requested if you are under 21 and is at the race organisers permission. Liability Waiver: The Liability Waiver and Release Form will need to be signed at registration before the event. Supported runners Gear Bag - This bag may not be any bigger than 75cm long,45cm wide and 45cm high. This may change in the August news letter. Supported runners do not have to take their sleeping bag and mat with then on any stage. They may wish to take them on the long stage to have a sleep at the intermediate point of the long stage if running on time. Blister Kit and First Aid Kit - Everyone is different, so make sure you have the gear that you need to repair those places that need attention. You must be able to patch yourself up. The medical people will not be there to fix the odd wee blister, on the other hand they are there to fix the odd big blister. • Mobile phone - These are for taking Photo’s, personal video blogs or if there is an emergency on the trail and you need to get in contact with the race officials. Fresh water is provided at each checkpoint and campsites in containers from which each participant can fill up their own water bottles. Water is provided by the Alps2Ocean ultra team, with each participant receiving the following quantities: 1.5 litres in the morning before the start of each stage 1.5 litres at every checkpoint No Limit of litres at the end of each stage at camp Hot water will be available at all campsites both in the morning and at the end of each stage for meals. Every Runner needs to have their passport punched by the Alps2Ocean team at each check point and at the finish line of each stage. Each check point has to be done in order of sequence. If a runner misses getting their passport punched they will have to return back to the last check point that they have missed and get it punched. The runner will still need to be making the cut of times to each check point. It the runner does not get their passport punched they will be pulled from the race. The check points will be placed in positions that best suit access to them. Check points will be placed between 10-15k in some instances there will be water drops only where a runner may be able to take 1ltr of water only as a top up. Because we are lucky enough to be running beside 8 lakes and rivers there will not be a problem with water supply. Runners will not be able to spend any more than 20 minutes at a check point, before they are asked to move on. There will be a longer stay allowed at check point 4 on the long stage. There will be medical people scattered around the course for each stage. Day’s results will be available at the end of each stage. This will have your stage time and your cumulative over all time. The time watch will be started at the beginning of each stage and will be stopped when the last runner arrives in. The winning individual and team will be that individual and team who has the lowest combined times of the 7 stages after taking into account any penalties. There will also be cut off times for checkpoints and all stage finishes. If a runner does not reach or leave a checkpoint in the designated times they will be taken from the race. The decision for that runner to continue will be at the discretion of the Doctor and race official. 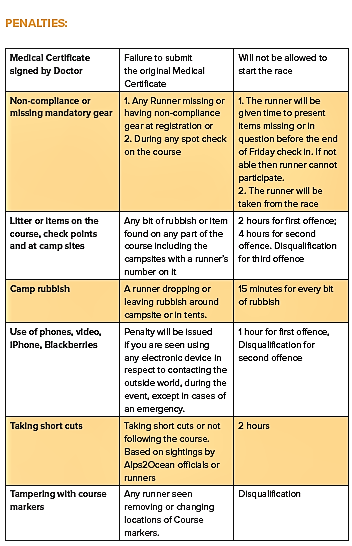 If a runner is taken form the course and then wants to return, this decision will be at the race official discretion. If allowed this runner will not get a finishers medal and will not be allowed to run the last stage. Look after this trail and the land that you are running on. Do not drop any paper, food, waste of any sort. Some of the land we are on is exclusive to Alps2Ocean Ultra and we don’t want anything to happen or be done that may hinder us being able to use in the future. Do not break or damage any trees. Stay on the marked trail at all times. Please, if you have to go!! Please at all times respect the environment. medical issue. Please remember this is for the more serious injuries, not for the odd wee blister etc. and continue with the race. Any runner cutting corners or taking short cuts will be taken from the race. If unforeseen circumstances occur the course may need to be changed or shortened. If for some reason we have to stop the race for a period of time due to unforeseen circumstance runners will be asked to stay put at the closest check point until such time as they are told to continue. On the long stage and the last day, we will be starting runners in different groups. The runners will be told of their groups the night before each stage. The course will be marked by signs, flags, ribbons, glow sticks, bunting, standards. Every effort will be made to make sure these are visually clear to the runners. If for some reason the visibility becomes too poor to see the markings. The course may need to be to changed. The trails will be marked at an appropriate distance as to be clear of the runner’s direction. Up to 50 - 200 meters depending on the visibility and obviousness of the course. If for some reason you feel you are going the wrong way go back to the last maker and continue. Alps2Ocean ultra promoters will be marking the course the nights before each stage. This will limit the time the markers are out in the elements. Each morning a patrol will be sent out to check the course and make sure all markers are in place. Any side road that may cause a problem will be marked with signs saying “WRONG WAY”. If there is a sudden change in direction we will have signs saying “THIS WAY”. At the finish of each stage there will be a camp site. The tents where you will stay will be set up by the Alps2Ocean team. • Toilets – portable toilets will be provided. • Water – both hot and cold water will be provided. Alps2Ocean Promotors will give each participant two race bibs. These must be worn at all times during the race stages - one for the chest and one for the backpack. These race bibs must be clear at all times and easily visible to the promoters and check point staff. If they are not there may be a penalty imposed. Alps2Ocean Ultra promoters will supply each runner with a race book. This will be in each runner’s race pack and should be read before the start of the race. The book needs to be carried with each runner for the entire race. The book will have important information in it such as Maps, elevation & cut off times. Each stage will be mapped out with distances, check points, toilets, water drops etc. The book will include all rules and regulations. Runners will be given a checkpoint passport card in their race pack. This will be very import to you as a runner. It is your proof that you have not cheated or missed a check point. At each check point your card will be punched. It is absolutely paramount that you do not lose this card. This card is also used as a safety check for Alps2Ocean Promoters to track where runners are. The Runners will start each day at approximately 7-8am. With the exception of the long stage and the last stage. On the long stage, the top 20 runners will start 2hrs behind the first runners to leave at 8am. The list of these runners will be announced and put up the night before. The last stage will have 3 staggered starts with the 1st group leaving at 7am. The second group at 8am and the last group at 9am. This is so all runners end up at the finish line within an hour of each other (hopefully). The Queens Stage will be approximately 86k and must be completed within a maximum time of 34 hours. Headlamps and a flashing red light on your backpack must be turned on at the approach of dark. We will have Hot water at check point 4 and 5 with some form of light shelter where you may rest up. Remember you still have to reach you cut off times. Alps2Ocean ultra will supply photo packages at a cost for each individual runner as per orders. All photos of individuals taken during the race may be use in any other advertising format to promote Alps2Ocean Ultra. If a runner decides to drop from the race they must inform race officials and this runner will be taken back to Oamaru where they will be looked after. If a runner who has dropped from the race wants to help with the duration of the Alps2Ocean Ultra. If a runner does not tell the official they are leaving the race, any cost incurred in relation to finding that said runner will be charged to that runner. All teams will start and finish at the same places as individual runners. Each team member will have to have their own passport punch at each check point and finish line. All team members need to cross the finish line at the same time and cannot be any further than 30meters apart for the entire stage. If a member of the team for some reason cannot continue in the race. The other members can continue on the race as individuals. There shall be no sharing of food or supplies between team members. No muling is allowed. Team members are not allowed to have other team members carry their food or equipment. Depending on the weather or any other unforeseen circumstances that leads to the race not be able to be held on the original course, the Alps2Ocean ultra promoters have the right to change the course to suit the conditions. They also have the right to shorten the course or cut sections if need be. In such an event, the Organizers will not be liable to refund the entry fee. The Organizers further represent that in such extenuating circumstances, they will use their best endeavours to Continue to hold the Event but in a modified form. Alps2Ocean ultra is happy for runners to take cell phones, iPod, MP3 etc with them. There will be no sources available for these devices to be charged. The only rule with cell phones is that they are not to be use for contact with any friends, family or the outside world during the entity of the race. They may be used to take photos, video blogs etc. We want this week to be about you and the journey you are on. Participants may use a GPS location device (such as Spot, Garmin or similar). The Race Director is the first port of call for anything to do with the Alps2Ocean Ultra. The Race Director is responsible for enforcing all race rules and enforcing Penalties. The Race Director or person appointed by him will conduct random mandatory gear inspections during the race on any racer and he will also conduct a mandatory check of the packs’ contents/weight and food. injury necessitate such a course of action. Alps2Ocean Ultra has no control over, and accepts no responsibility for, the availability or standard of medical and/or repatriation services and facilities in the area in which the events take place, and such services and facilities do not form any part of the contract between you and Alps2Ocean Ultra. You are solely responsible for your own equipment and belongings during the event and bear the sole responsibility for incidental or accidental damage (including wear and tear) to, or loss of, your own equipment and belongings. We recommend that you take out adequate insurance to cover your equipment and belongings. Alps2Ocean Ultra will not be liable to you for: (a) any loss of or damage to your equipment or personal effects; (b) any indirect or consequential loss; or (c) any loss or damage suffered or incurred by you arising out of or in connection with competing in the event (including, without limitation, travelling to New Zealand) Except as otherwise provided by any applicable laws, Alps2Ocean Ultra maximum liability to you for any claim in contract, tort, or in any other cause of action arising out of or in connection with the Events will not exceed the entry fee for the Events. dehydration, fatigue, collisions or incidents involving other participants, spectators, other road users and/or vehicles, aspects of the course or bad weather conditions and other causes. You agree to inform Alps2Ocean Ultra on your application of any pre-existing illness from which you suffer that may affect your performance during the event or for which medical treatment may be needed. In addition, you agree to inform Alps2Ocean Ultra, both on application and thereafter, as the need arises, of all medications that you are currently taking or will be taking while you are participating in the event. You acknowledge that it is your sole responsibility to carry your personal medications with you throughout the event. Alps2Ocean Ultra medical support staff will not be able to, nor will it be liable for failing to, supply personal medication during the event should a participant fail to carry his or her own. Alps2Ocean Ultra will provide professional medical support to participants throughout the duration of the event. You give permission to medical support staff to make decisions concerning medical care and treatment, and where necessary to authorize such care and treatment in emergency situations. You understand that event staff will make every reasonable effort, in the circumstances, to reach your emergency contact (if you have supplied one to us prior to the event) regarding your medical status in the event an emergency arises. You acknowledge that the event operate in very remote areas and that transportation to the nearest hospital may take several hours or longer. You further acknowledge that the course may pass though varying terrain where emergency evacuation may be seriously delayed. Alps2Ocean Ultra reserves the right, with or without consultation of a doctor, to stop and use such force as is necessary to restrain you from starting or continuing in the event. By agreeing to these Rules and Regulations and applying to compete in the event, you affirm that you have the understanding and mental capacity to communicate health care directives for yourself. breach of these rules is considered a serious matter, with penalties commensurate with the nature of the occurrence as noted in the list below. These range anywhere from immediate disqualification for egregious behaviour, to time penalties for matters deemed to have lesser impact. We are required to adhere to rules laid down by the permitting authorities. Penalties will be assessed on a daily basis. NOTE: The Organisers retain the right to amend these penalties from time to time. 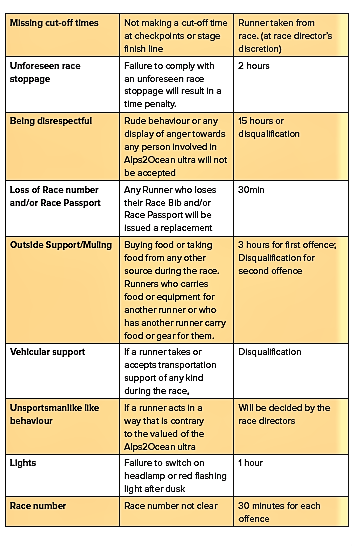 Spot checks will be undertaken throughout the race to ensure compliance with the rules.